When, where, and how did Hasidism emerge? How did it establish its base territory? 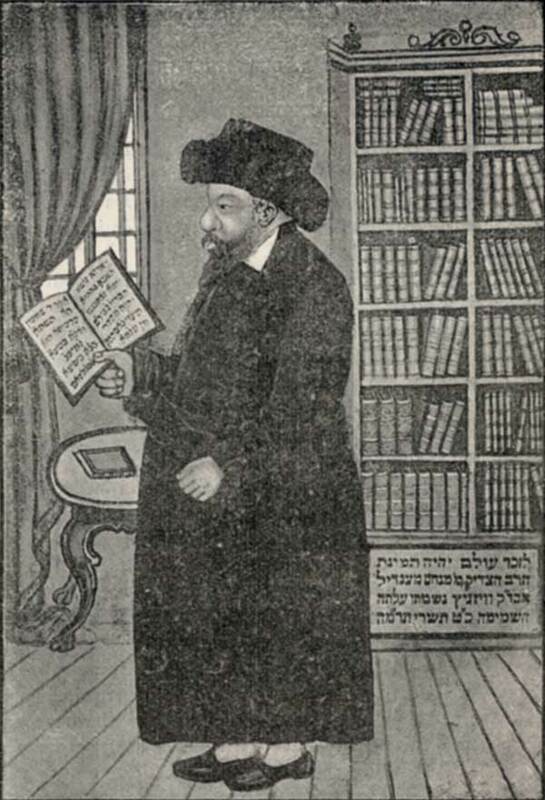 This chapter analyzes the early stage of Hasidism’s emergence and the role of this early period in the formation of Hasidism’s “mental geography.” The chapter begins with the map of the area in which Hasidism’s alleged founder Israel ben Eliezer, known as the Ba’al Shem Tov, was active, followed by another of the dispersion of the Hasidic leadership in the last quarter of the eighteenth and the beginning of the nineteenth century. Later maps show the early Hasidic settlements in the Land of Israel and another the formation of the anti-Hasidic opposition, known as the mitnagedim. Collectively, the maps show how Hasidic invention of an “imagined geography” for itself, its territorial dispersion, and the process of group formation in response to the largely unsuccessful opposition, made Hasidism into a self-conscious religious movement with a clearly defined spatial identity. When, if ever, did Hasidism conquer Eastern Europe? How should we estimate the growth and dynamics of the movement? 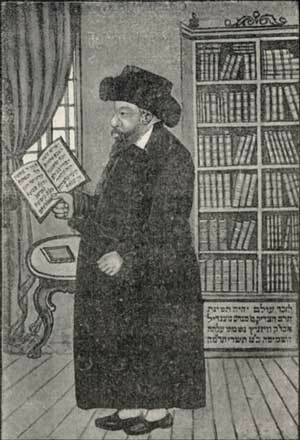 Historiography has traditionally assumed that Hasidism already had achieved its demographic dominance in most of the Eastern European territories by the end of the eighteenth century. Recent research, however, indicates that these inflated estimates are far from accurate and, more importantly, cannot be traced to any verifiable data. Based on a database of nearly two thousand Hasidic leaders whose geographic locations were determined according to their main places of residence and activity, a set of five maps charts the size, directions, and dynamics of Hasidic expansion. In sequence, the maps illustrate (1) the growth of Hasidism in the south-eastern provinces of the Polish-Lithuanian Commonwealth, (2) its slow expansion north- and westward in the late eighteenth and early nineteenth century (3) the heights of its demographic influence in mid- and late-nineteenth-century Galicia and Central Poland, (4) its move to urban centers in Poland and dramatic removal from the territories of the Soviet Union, and (5) the movement’s migration southward to Czechoslovakia, Hungary, and Romania. The chapter concludes with the attempt to estimate the actual demographics of the Hasidim around 1900. With the institutionalization of religious charisma, Hasidism developed highly effective forms of leadership and succession traditions. This gave rise to Hasidic dynasties, which in the nineteenth century became the dominant method of organization within the movement. The maps in this chapter show the territorial expansion of the twenty-two dynasties, chosen for being especially influential or typical in their patterns of expansion. Above all, the maps prove the existence of relatively clear boundaries between specific dynasties. Though there were boundary disputes, almost every major dynasty administered a clearly marked area where its influence was unchallenged. The maps also demonstrate the existence of two dominant patterns of territorial expansion. In the centralized model, only a single descendant inherited the tsadik’s seat, making it an important center of power. In the alternative model, most of the tsaddik’s descendants concurrently took on the duties of tsadikim in many local towns, this creating a network of Hasidic courts and parallel connections. Of course, there were also hybrid arrangements; as the disruption of the model could be caused by a crisis of authority in the centralized dynasty, but it could also serve as an intentional strategy of expansion. Fig. 4.1.4: According to the legend, R. Menaḥem Mendel of Kock lived for twenty years in seclusion in the tower of his house in Kock. 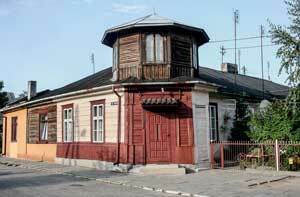 In fact, this house was bought only in the interwar period by the grandson of R. Mendel. Photo by the author. What is a Hasidic court? What distinguished the seat of a Hasidic leader from other seats of religious authority, both Jewish and non-Jewish? How was it organized, spatially and socially? This chapter focuses on two aspects of this key Hasidic institution. First, taking the example of the Góra Kawaria (Ger) court, it shows the locations of Hasidic courts in relation to their mostly Christian neighbors and the socio-religious connotations of this set-up. In addition, the chapter discusses the topographies of two courts, one in Kozienice in Central Poland, and one in Lubawicze in Eastern Belarus, including their specific structures and socio-religious functions. Second, by analyzing a court in Grodzisk for which we can trace more than 6,000 petitions with known places of origin, this chapter shows the spatial structure of a Hasidic court’s sphere of influence, which was determined by three interconnected phenomena: distance, the railroads, and local fame. Fig. 5.1.2: Hasidim in Łowicz with the number of worshippers in each shtibl; early twentieth century. Source: Lovitsh: ir be-Mazovia u-sevivah; sefer zikaron = Lovitsh: a shtetl in Mazovie un ungegnt, ed. G. Shayak-Charnezon (Tel Aviv, 1966), 126. Just as not all Roman Catholics live in Rome, the overwhelming majority of the Kock Hasidim did not live in Kock, nor did the Hasidim of Aleksandrów live in Aleksandrów. The great majority of Hasidim lived at a distance from their leader and visited him once, or at most a few times, a year. Thus, the chapter asks: what was the Hasidic way of life like and what did the geography of Hasidism far from the Hasidic court look like? To that end, the chapter takes a close look at shtiblekh, meeting places where a typical Hasid would spend his free time with other men in the community, united by a highly emotional and intense group experience. This chapter shows the locations of shtiblekh in urban topographies and the internal structure of one exemplary shtibl. Above all, it analyzes the spatial relationship between the courts and their shtiblekh, which were dispersed throughout the vast territories of Eastern Europe. The maps here are based on an incomplete list of nearly three thousand shtiblekh in existence in Eastern Europe from the 1890s to the 1930s. They show not only the hierarchies and boundaries of specific groups and their dependence on nineteenth-century political borders, but the connection between a given group’s model of spatial expansion and its type of spiritual leadership. Map 6.2.1: Hasidic prayer halls in New York, 1918. 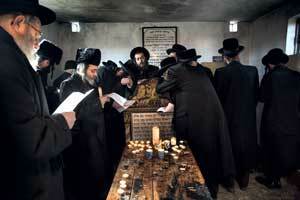 Before the Second World War, Hasidism was an almost exclusively Eastern European phenomenon. This changed only after the Holocaust, when North America became one of the two most important centers of Hasidism in the world, retrospectively lending significance to earlier Hasidic immigration there. This chapter tracks Hasidic settlements in the New World, from the first recorded Hasidic shtibl in New York in 1873 up to the beginning of the Second World War. The maps show the small number of Hasidic shtiblekh in North America before 1901, which were mostly concentrated in New York, Philadelphia, and other East Coast cities. Additional maps zoom in on New York in 1918 and 1939, showing Hasidism’s hesitant development on the Lower East Side of Manhattan, followed by its move to Brooklyn, with significant outposts in Upper Manhattan and the Bronx. The data also provides evidence for the dominance of Belarusian-Lithuanian groups until the 1890s when they were eclipsed by Galician immigrants. Between 1914 and 1945 the traditional world of the Hasidism—indeed the world as a whole—was utterly transformed. It was a time of mass migrations and expulsions, which brought about unprecedented demographic, social, ideological, and religious changes. This chapter begins with the mass dislocation of Hasidic leadership during the First World War and the profound changes to the movement’s geography, both of which had a lasting impact on the geographical and social structure of Hasidic influences in Europe. Illustrating the changes brought by the World Wars is a map of the dislocation experienced by forty-five Hasidic leaders in revolutionary Russia and the Soviet Union between 1917 and 1964. Generally, they suffered one of four fates: fleeing to the great cities of Russia, dying in pogroms, emigrating to Poland or the United States, or being exiled to Siberia or Central Asia. By contrast, a map of yeshivot illustrates the brighter side of the interwar period: the new educational achievements and intellectual ferment of Hasidism in Poland. The chapter concludes by highlighting the principal sites of the destruction of Eastern European Hasidism, showing eighty Hasidic leaders’s paths to death during the Holocaust. Fig. 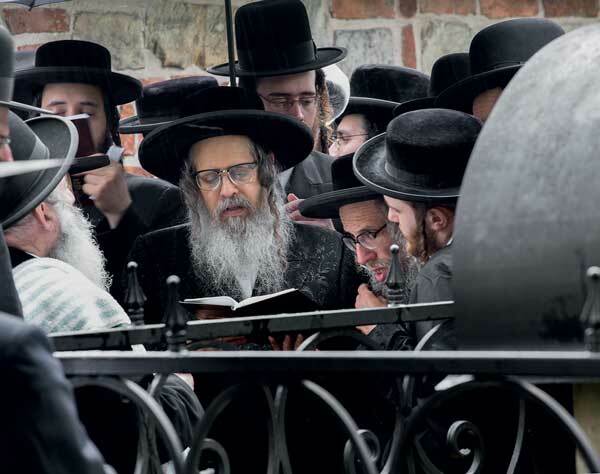 8.3.2: R. Zalman Teitelbaum competes with his brother R. Aharon over the leadership of Satmar, by far the largest group in contemporary Hasidism. Photo by Agnieszka Traczewska. How many Hasidim survived the Holocaust in Eastern Europe? How did they manage it? How many Hasidim are there today and where do they live? This chapter starts by tracing the escape routes taken by the most important and most influential tsadikim who managed to survive the Holocaust and continue their dynasties. Though it is difficult to find patterns among these truly exceptional cases, it has been observed that a relatively high number of those who survived did so by escaping completely from Nazi-occupied Europe and that the largest groups of Hasidim are overrepresented among survivors. The picture is completed with the map of Hasidic settlements in Antwerp before and after the Holocaust, showing the community’s remarkable contemporary revival. The bulk of the maps in this chapter, however, are based on a database of 130,000 Hasidic households, nearly all of those in existence today. This unusually complete data set allows for a detailed reconstruction of contemporary Hasidic geography and demography. The maps based on these data show the absolute and relative size of the Hasidic populations in individual countries and localities, and include information on individual dynasties and Hasidic leaders. The chapter ends with a discussion of the development of Hasidic missionary activities, as exemplified by the Chabad-Lubavitch movement. Fig. 9.2.5: Contemporary pilgrimage to the grave of R. Yeḥezkel Shraga Halberstam (1813–1898), the tsadik of Sieniawa. Photo by Agnieszka Traczewska. One of the most interesting features of contemporary Hasidic culture is the tension between Hasidim’s current places of residence and their identification with Eastern Europe and the pre-Holocaust areas of the movement’s development. Today, newly formed groups select their names by looking to locations in Eastern Europe, preferably those associated with extinct dynasties, which clearly testifies to contemporary Hasidism’s deep mental roots in an imagined geography of Eastern Europe. This chapter shows the contemporary Hasidic impression of the geography of Eastern Europe, which is based on nineteenth-century political and administrative regions and not contemporary or even twentieth century, boundaries. One map classifies the twenty-seven most commonly mentioned dynasties according to their supposed location in one of the following nineteenth-century regions: Poland, Galicia, Lithuania, Ukraine, Russia, Hungary, and Romania. The book concludes with five maps of the locations of 160 graves of tsadikim in Europe, North America, and Israel visited by Hasidim. Although not exhaustive, it shows nearly all the places that are important to and present in the collective memory of Hasidim today.